The Rocky Horror Picture Show25th Anniversary DVD was relased on October 3, 2000. Earlier this year, EntertainmentWerks campaigned for the features that the fans wanted most. Check out our coverage of the new DVD as well as the previous incarnations of Rocky Horroron home video. Or, If you read just one thing, read this! Fox has certainly released its share of Rockyvideos. How many do you have? Some fans cry "Fix the Sound!" Here's why, and the reason it should finally happen on DVD. So we got a Rocky HorrorSpecial Edition already. Why another one? Plenty of reasons. Rocky Horror DVD Producer David Britten Priortalks with EntertainmentWerks. Alien Legacy producer David C. Fein talksabout his Rockypast. 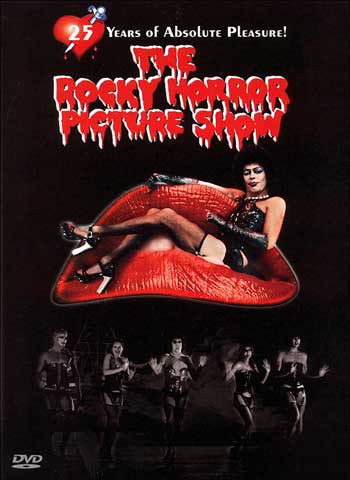 RHPS Sourcebook editor James Norman tells Rockyfans how to get it right. Antny (visit his Rocky Horror Collection), Chris O'Neill, David C. Fein and Sharpline Arts, Kev J.B. of Sanity For Today, James Norman (check out his RHPS Sourcebookfor casts), Ruth Fink-Winter and Crazed Imaginationsmagazine, Zenin of Zenin's Rocky Horror Archiveand Cosmo of Cosmo's Factory for assistance with this page. You can save and use this banner to link to our page! If you can tell the differences in the samples contained in these articles, let them know about it! DISCLAIMER: This site is not affiliated with 20th Century Fox, TCF Home Entertainment, Sharpline Arts, Chace Productions or any other entities refered to within these pages. All copyrighted or trademarked artwork or names are used on this site within the context of review or informational purposes, defined by the United States Government as Fair Use.